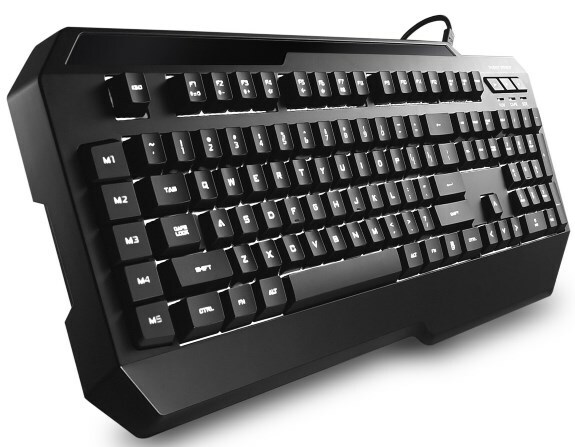 Cooler Master shows off the CM Storm Suppressor, a new gaming keyboard with membrane key switches, five macro keys, three profiles and media control keys. The Suppressor will ship for 45EUR but will only be available in Asia, Eastern Europe and Russia. Cooler Master, a leading creator, innovator, and manufacturer of desktop components and peripherals, today announced the Suppressor, a keyboard tuned for gamers that enjoy being the silent assassin. Serious gamers take note; the Suppressor is well balanced to assist in deploying to each and every arena. Suppressor is uniquely tuned to be your ideal tool for battle with a detachable USB cable for better and easier cable management and travel, a white LED light that keeps you gaming even in the darkest reaches of a LAN, silent membrane key switches equipped with a long life material to last through many skirmishes, and instant activation multimedia keys to activate your war songs. Add in its lightweight and durable design and Suppressor becomes a force to be reckoned with.The Suppressors LED backlight can be adjusted in 3 brightness levels or can be completely turned off. And for a more ergonomic gaming experience the Suppressor comes with a removable wrist rest in the box. Cleverly integrated into the Suppressor are features for when your game needs to be taken to the next level. A powerful 32-bit / 72 MHz ARM Rapid Engine is dedicated to executing macros. Up to 75 of which can be stored within 5 easily swappable profiles via built-in shortcut keys. That amounts to 15 macros per profile, ensuring there is plenty of room to customize your gaming experience within your most frequented games. All macros are saved on the Suppressors 128 kbs onboard memory so the keyboard is ready for plug and play use. Macros can be hardware recorded or with software that is downloadable from our website. The CM Storm Suppressor will be available for Europe only in East Europe Region and in Russia for a suggested retail price of 45 euro. Price and availability may vary based on region. This release is meant for the East Europe and Russia region(s) only. The product will become available in Asia as of October but will follow in Russia and East Europe around December/January.